Spring is in the air! 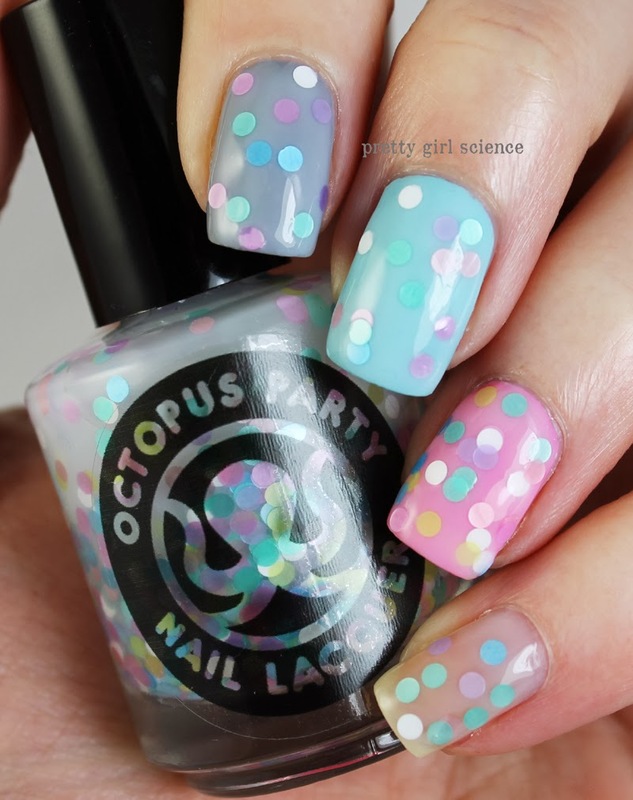 Bees are buzzing, birds are chirping...and Octopus Party Nail Lacquer mix-master General Dave is hard at work. He's been slaving away in the Octo-lab, and he's created some really neat stuff. He was kind enough to send them along to me, so I could share them with you! The first cream polish from OPNL. It actually applies really nicely for a color so light. I was expecting streaks and misery, but thank the heavens I was wrong. The formula is thin, but not watery. I was able to get very thin-yet-even coats out of this, which I generally never can get from most polishes this close to white. I almost want to say I see tiny bits of shimmer/glitter, but they don't actually reflect any light so I'm not sure. It reminds me of peach ice cream on my nails. I hope he keeps making polishes like these. Pastel Pete has round, satiny dots in a thick milky base. I would not try building this up to opacity. There is no way to get a solid cover without looking like you were wearing bad acrylics. 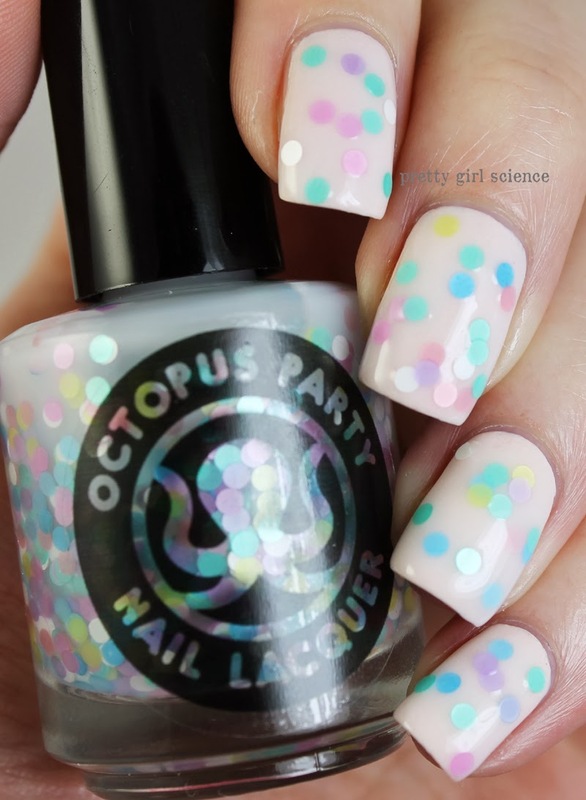 The dots took a little dabbing, but laid flat on the nail. Round glitter always worries me. I like tacos, but not on my nails. I tried it over a bunch of different colors, just to see what color dots would pop out. I think I prefer it over gray, as seen on my index finger. It nudges the Easter/spring down a bit. On my middle, I used Wet 'n' Wild I need a Refresh-Mint and I love how the white dots jump out, while the minty ones recede. On my ring, I used Sinful Colors Cotton Candy. Absolutely reminds me of a baby shower. On my pinky, I didn't use a base, just to check out how milky the base of this topper really was. I feel like it mutes the yellow tinge pretty well. Maybe I can talk Dave into making some sheer polishes? Holy glitter-bomb, Batman! Pink, black and...abalone teal?! I love this one. I did three coats on my index, middle, and pinky fingers for an opaque look. It lays smoothly: no need for Gelous! On my ring, I used Cotton Candy again as a base. That is one thin layer over Cotton Candy. Like other glitter-bombs, the base is thick. But its easy to apply a thin layer and still get decent coverage. I can't wait to try this over a teal. Laser Tag is one of my favorites. Unfortunately, Dave wasn't happy with the formula. He went back to the Octo-lab and tinkered around with it. Now its more purple, and decidedly easier to work with. I used 3 thin layers on my index, middle, and pinky fingers. On my ring, I used Fingerpaints First Edition (a bright syrupy purple) and layered two coats of Laser Tag on top. I was very happy to see that layering didn't kill the sparkle and depth. It still has that amazing holo sparkle, which is all that really matters. I am so honored to get ahold of Daves first holo! 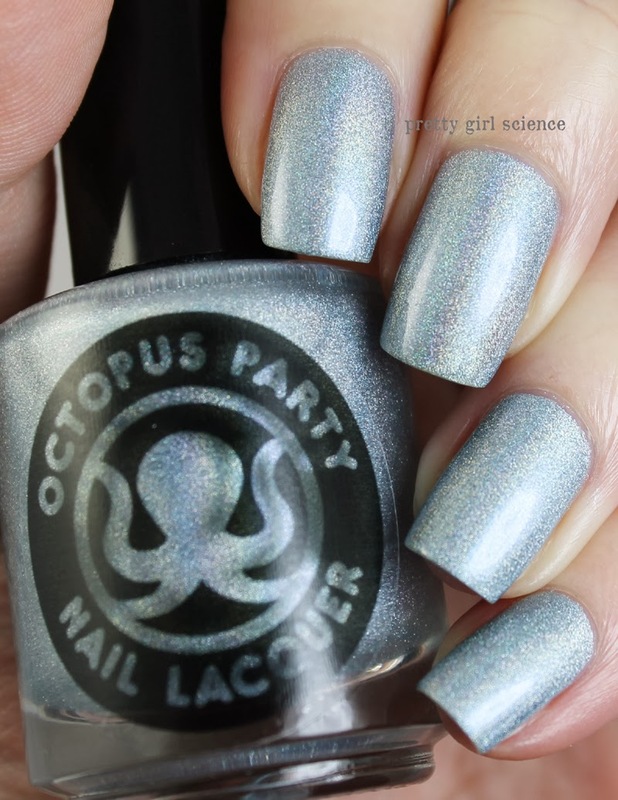 Its a silvery, icy blue linear holo that applies like a dream. Two coats is all you need! It even plays nicely with Seche Vite. I have never used a holo that applies as smoothly as this one does. It has a pretty good rainbow, which I would loooove to show you. But I can't. There is no sun. You'll have to trust me. It's not bam! in your face, but it isnt as subtle as those damned China Glaze holos from last year. (yes I'm bitter).